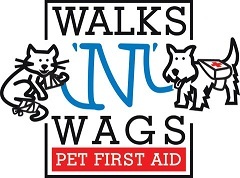 Walks 'N' Wags are National Leaders in Pet First Aid and have the longest standing Pet First Aid course in Canada. It has earned the "Stamp of Approval" from Animal Wellness, North America's top Animal Wellness magazine. The hands-on live practice gives you the skills and confidence to deal with illness and emergencies. Upon successful completion, you will receive a Certificate valid for 3 years. ​This supplemental course is for outdoor enthusiasts, farmers, hunters, campers, remote communities, hikers, cottage owners, and anyone without easily accessible Veterinary care. ​Upon successful completion, you will receive a Certificate valid for 3 years. Are you looking for a speaker for your group or organization? ​K9 Compass will present a fun and interactive one-hour Pet First Aid seminar. Many accidents can be prevented. Often we don't think of the potential dangers we may be exposing our pets to in everyday situations. The stories shared are about real life situations that have happened to pets of friends, clients and colleagues. K9 Compass also offers private in-house classes for businesses and organizations. Please contact us for more information. ​Our Pet First Aid Course is approved for 5 CEU's for active members of Pet Sitters International (PSI). ​​Complete your Pet First Aid Training and get a discount on PROfur insurance for your pet care business.